Kai is an elegant creature, who carries himself with a regal sort of grace. His coat is a dusky brown color, pale at the base and fringed with dark points like a Siamese cat. Across his haunches is a rosette pattern of spots, the hue a dark mocha against the paler tan of his base coat, and the spots tinging a paler shade of brown against his dark points. 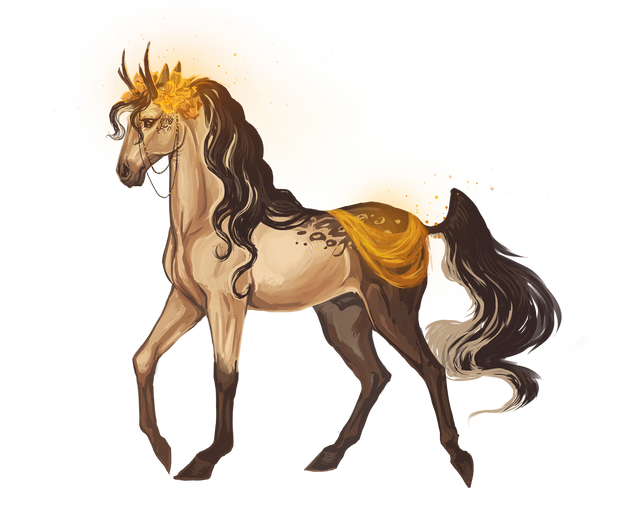 He carries his tail high and regally, the strands generally dark but highlighted with lighter tones as well. Upon his head are a pair of short antlers, sharp and dangerous, though seldomly used for self defense. Kai can be categorized as a spiritual sort of creature, in tune with nature and drawing his energy from the natural world. As a healer, he is an empath, astute and drawing in the emotions of others to try and take away their hurt and sorrows. He is not magically inclined in this manner, but instead senses the feelings of others through observation and careful attention to the world around him. He is a warm creature, thoughtful and caring to a fault. In some ways, these personality traits can make it likely for others to take advantage of his kindness, but Kai also has a level head on his shoulders and is not naïve to the evils of the world, choosing instead to hope for good. He is quick to trust others, though if that trust is broken, can be wary to trust the individual again. While he does not hold grudges, he protects his own heart at all costs, knowing that opening himself up to pain will diminish his efficacy as a healer. He strives to be neutral in matters of politics, listening to both sides and easily offering opinions on both sides, making him a worthy advisor to those in need. It is thought that Kai was built from the earth itself, brought to life by Mother Nature and raised in her loving embrace. He is a creature who is in tune with the natural world, drawing his energy from spending time alone in nature, and using his time in nature as a way to recharge after expending energy on his healing or empath activities. Little is told of the place where Kai was before Novus, and he does not speak often of his past – for Kai is a creature who does not dwell on what was, focusing instead on the present. If he were to speak of such things though, he would whisper of training in the healing arts by a long-lost Ilati medicine woman, in a place far from Novus. She taught him the ways of the Ilati shaman, and how to utilize the natural world toward cures for ailments and wounds. Day and night, the two were ensconced together in the wilderness, and she told him stories of her homeland – a place called Novus, somewhere far from where they wandered. Only once she felt he was ready, did Kai branch out to find the fabled Novus, making his way eventually to Terrestella. Since arriving to Novus, he has maintained something of a low profile. Before deciding to join the Dusk Court, he wandered in a rather unnoticed fashion through the lands, learning about them and observing the world around him to gain knowledge about the lore. He began his time here by worshiping each of the gods, by watching the way that others paid their tributes, and by listening to the rumblings and quiet conversations around him as he traveled. It is only after such a time that he decided to make his home in Terrestella, finding the land itself most conducive to his desires. Kai wears a golden drape along his hide, paired with a golden crown forged from autumn leaves and vibrant tiger lilies. A pair of twin chains drape from his headpiece as well, and both items glow with an otherworldly hue, trailing golden stardust in his wake. The enchantment is simply a beautiful glow, and his outfit does not hold any magical power.